There is nothing to do around here in winter. Except for walking along the seawall of the U.S. Naval Academy, as neighbors and fit Midshipmen jog by and a couple hundred sailors breeze past in the Annapolis Yacht Club Frostbite Races on Sunday afternoons. Nothing to do but head over to Quiet Waters Park and find some friends frolicking with their pets in the dog park, go to the public ice rink and skate around in circles to classic rock, and grab a hot chocolate and some chili. Nothing, really, except for the first three Thursdays in December—the first two for Midnight Madness and the third for the Eleventh Hour—when all the downtown shops remain open late for shopping, pub-crawling, alpaca-petting on the sidewalk (you can’t make this stuff up), chocolate-covered strawberry and free Christmas cookie eating, and watching groups of carolers sing on Maryland Avenue, so lovely framed in garlands and twinkling lights, with the State House as a backdrop and a horse-drawn carriage jingling by, that you think maybe you’ve been transported into a Norman Rockwell painting. What am I doing the second Saturday night in December? Duh! 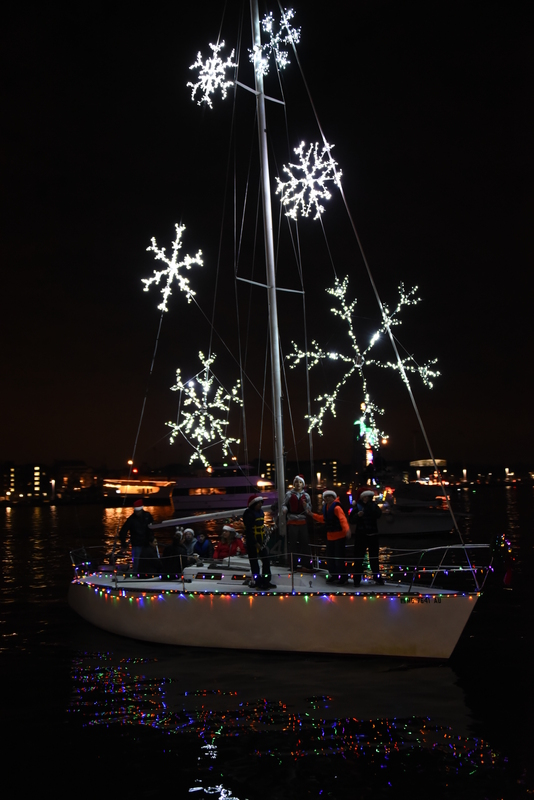 What everyone in Annapolis is doing: checking out the Eastport Yacht Club Lights Parade. Usually, we wander down into the crowd and watch the spectacle of boats and lights from the Eastport Bridge, until it gets cold, which it almost always does. Then, we walk briskly through the nippy night air to a friend’s house for our Curried Christmas dinner tradition, because, as we like to say, nothing says Christmas like curry. There’s not much to do around here in winter unless it snows. It does not need to snow a lot here. An inch will do. It’s a town filled with sailors. As soon as there’s a dusting of snow in this place, everyone makes a mad dash for the nearest bar as if it’s the only shelter. Walk into McGarvey’s Saloon and Oyster Bar after five inches of snow have fallen, and you’ll find customers five deep at the bar. I’m not always proud of this boozy mentality, but let’s be honest. It’s a small town. That’s how we roll. There’s not much to do around here except drive over the Chesapeake Bay Bridge to the popular Talbot Street Parade in St. Michaels at 10:30 a.m. December 14, which may out-Norman-Rockwell the Maryland Avenue scene in quaintness and make a Grinch’s heart grow a notch. Maybe I’ll just walk down and say hello to my sailing friends, who live on their boat with their two dogs on the City Dock along Ego Alley in winter. They have learned over the years that the best way to enjoy the delicious nothing-to-do-ness of our fair city is to sit on deck, hot buttered rum in hand, and watch our quirky little world spin. When she is not working as managing editor of SpinSheet and PropTalk Magazines, Molly Winans plans to hole up this winter to finish her second novel. « One of Those Vinyl Nights….